A dad of three week old twins wants to know if he has to get up in the night to them. A dad has taken to the internet to get advice about his part in fathering his newborn twins. Basically, said father doesn’t think he should have to ‘get up in the night’ to comfort them when they cry. 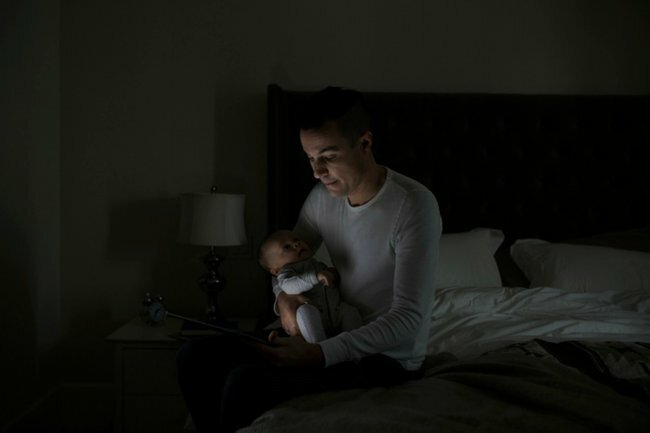 He works between 72 and 84 hours per week, or 12-hour shifts, while his wife (who only gave birth three weeks ago) is at home with the babies. Speaking of babies, here are some MM confessions on strange pregnancy cravings. Post continues after video. “I help whenever I’m not working but have told my wife she has to cover the overnights as I need sleep for work,” he wrote on Reddit. “She thinks it’s unfair, however she can take two hour naps while they sleep while I can’t do that at my job,” he continued. “I’m up early on the weekends and take care of them while she sleeps in. I’m not trying to get out of doing my part but AITA [am I the a**ehole]?,” he said. He added that he is on ‘dad duty’ from the moment he gets home, until the moment he goes to sleep to give his wife some rest. The couple also have a nanny who helps out between 8am and 3pm four days a week. She does all the housework. Opinions were divided with the man’s dilemma, of which there were more than 700. Listen to the hosts of the Baby Bubble discuss what to do when your baby won’t sleep. Post continues after audio. “You signed up for this when you had kiddos,” one person wrote. “70+ hour work weeks isn’t doing his part?,” another responded. “It’s only been three weeks, she’s still bleeding, in horrible pain, exhausted, hormones crashing,” reasoned another. “Her body will heal and she will be able to handle more and more, but at three weeks she is physically suffering,” they added. What do you think? Should this dad have to get up in the night?